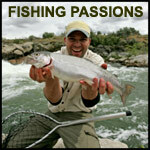 By voting on the books listed, you can help to determine whether a book is related to the theme of Fishing Passions, or whether it is a non-related, but popular, book among the members of the site. If you believe a book in the list below is 'on theme' with Fishing Passions, vote that it is relevant. (If you don't know, just skip it.) Over time, we hope to have a library of books that should be of interest to Fishing Passions members. This book is helpful, instructive, easy to understand, and will help you bring more of your catch to the net. It is for this reason that Collector Books has asked one of the foremost experts in this unique hobby to author this helpful book. A broad range of topics of interest for visitors to the keys are covered in this guide, including how to fish the bridges, how and where to tow your boat into the keys, and how to charter a captain. For both armchair travelers and avid outdoorsmen who may have already started a checklist of their own, Santella maps out, thoroughly reviews and provides beautiful photographs of the meccas of the fly-fishing world.